The Power Plana is the Ideal-Fin for the Tech Diver Made of nearly Indestructible Natural Rubber, this High Performing Vented Open Heel Fin is ideal for All-Kinds-of-Kicks. The High Density Material makes the Fin Negatively Buoyant, a desired feature when using a Dry Suit and a Tech Rig with Steel Back-Plate. The patented Bungee Strap with Large-Finger Loop is the Best-Solution for both Comfort during the Dive and when Donning /Doffing. 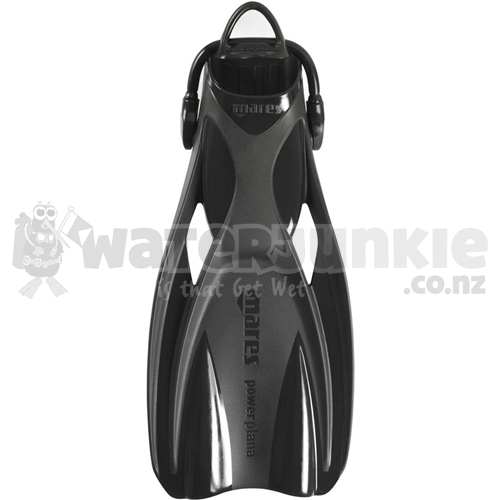 Unlike Competitors' Fins, the Mares Rubber Fin offers a Full-Shape Foot Pocket. Fins are available in Regular, X-Large or 2X-Large, is Black in color and has a 10.83" (27.5 cm) Blade. The Regular Size Fins weigh 2.87 lbs (1.3 kg). The Ribbed Blade Channels the Water Down-the-Blade Surface for Maximum Thrust with Minimum Effort. Fins are covered by a 24 month limited warranty.